As London’s population skyrocketed in Victorian times, its graveyards became overcrowded and decayed. Seven giant London cemeteries were built outside central London’s squalor to bury its dead. Here’s a list of the ‘Magnificent Seven’ London Cemeteries you can still visit to this day! Kensal Green is one of London’s greatest cemeteries, with many impressive memorials to its dead. Kensal Green was the first cemetery built after the threatening state of London graveyards had been reached. There were dead people buried in unmarked plots that already contained bodies, and epidemics spreading across the city as decay infected the water supplies. Luckily, Kensal Green cemetery was established in 1833 to save the dead as well as the living population of London. Inspired by the famed Père Lachaise Cemetery in Paris, this London graveyard was the shelter to bodies of different faiths, up to 700 distinguished personalities, and over 33 species of birds. Notable burials include authors William Wilkie Collins (1824-1889) and William Makepeace Thackeray (1811-1863). This immortal cemetery, standing the test of time, is still in use to this day. You can find Kensal Green Cemetery at Harrow Road, London W10 4RA. West Norwood Cemetery, in South London, is worth the visit for its nature and memorials. This Victorian cemetery, also called the South Metropolitan Cemetery, has been a centre of attraction because of its mixture of the Gothic architecture and its mystical sepulchral style. Established only three years after the Kensal Green, West Norwood Cemetery is surrounded by railings and walls to keep the bodies protected from the body snatchers or the resurrectionists. The West Norwood Cemetery is listed as the first one with the Gothic Revival design. Fanous Burials include Sir Henry Tate, the founder of London’s Tate Gallery (1819-1899), Charles W. Alcock (1842-1907), creator of the FA Cup, and Isabella Beeton(1836-1965), the cookery writer better known as Mrs Beeton. You can find West Norwood Cemetery at Norwood Rd, West Norwood, London SE27 9JU. Highgate is known as one of London’s greatest cemeteries and its infamous vampire legend! It looks like three is the magic number here, as the Highgate Cemetery was also built three years after West Norwood Cemetery. Highgate Cemetery has a unique history with vampires, holding the occult activities of the Highgate Vampire, along with ghosts and the mysterious voices calling. You can read about the Highgate Vampire here. You can find the Highgate Cemetery at Swain’s Lane, Highgate, London N6 6PJ. Abney Park Cemetery is home to the dead, and plenty of the living, including bats! Built in 1840, Abney Park Cemetery was named after 18th Century Lord Mayor of London, Sir Thomas Abney. The non-denominational cemetery occupies about 31 acres of nature reserve and Victorian centres. Scrawled in large hieroglyphics at the frontage, “Abode of The Mortal Part Of Man” will welcome you as you enter the cemetery. Designed in the Egyptian Revival style, this London graveyard was a source of controversy, as it strayed from the traditional Christian Gothic style. Famous burials William and Catherine Booth, founders of the Salvation Army. Abney Park Cemetery is at 215 Stoke Newington High Street, Stoke Newington, London N16 0LH. Nunhead Cemetery may not be as well known as other graveyards but it’s just as memorable. Being a nature reserve just like the other Magnificent Seven Cemeteries, Nunhead Cemetery is, however, the least famous. This London cemetery was established in 1840 on the side of the river Thames, facing the West Norwood Cemetery on the opposite side. 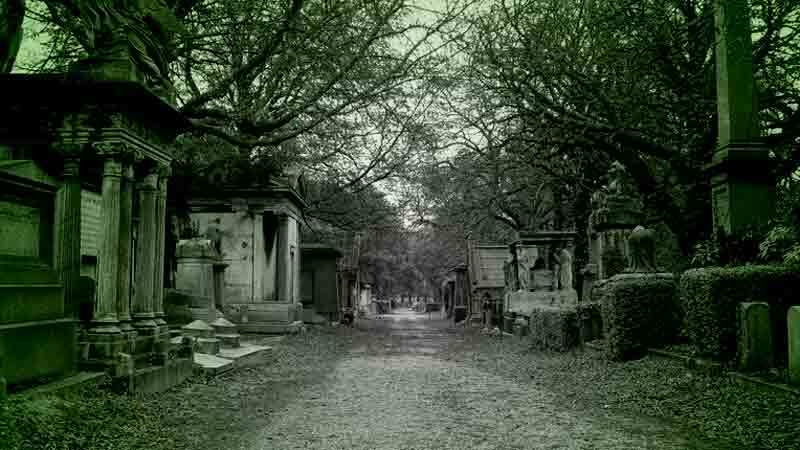 The Victorian cemetery, also called the All Saints’ Cemetery, received its first burial in October 1840. It contained an Anglican designed chapel, monuments and valuable memorials of notable personalities. The memorials were restored in 2001 after being neglected by the United Cemetery Company and vandalized. You can find Nunhead Cemetery at Linden Grove, London SE15 3LP. Brompton Cemetery, not far from Earl’s Court, is a great place to visit to see its interesting burials. Located in the Royal Borough of Kensington and Chelsea, the Brompton Cemetery was consecrated in 1840. Holding more than 35,000 monuments, this London cemetery is considered one of the most historical in Britain. The story says that a mausoleum on the Brompton Cemetery is shielding a time machine created by Samuel Warner and Joseph Bonomi, the former being an inventor of weapons, while the latter was an Egyptologist and sculptor. Warner died in enigmatic circumstances. Some suspect Bonomi killed Warner out of fear that the time machine would fall into evil hands, while others believe that Warner simply travelled in time. The mystery of his disappearance is still unpuzzled. Famous burials include actor Ernest Thesiger (1879-1961), horror star of The Old Dark House and Bride of Frankenstein, and Robert Keeley (1793-1869), who originated the character Fritz in the first stage adaptation of Mary Shelley’s Frankenstein. William Terriss (1847–1897) the murdered actor behind the infamous haunting Covent Garden/Adelphi Theatre hauntings, is also buried here. Brompton Cemetery is Fulham Rd, Kensington, London SW10 9UG. London graveyards don’t come any spookier and overgrown as Tower Hamlets Cemetery. Opening in 1841, Tower Hamlets Cemetery is now a natural reserve. This London cemetery survived the horrible damages caused by World War II, during which it was bombed five times. Tower Hamlets Cemetery embraced the bodies of the war victims, as well as many people from the East End. You can find Tower Hamlets cemetery at Southern Grove, London E3 4PX, England – a short walk from Mile End Tube Station. London's Underground is creepy. This new DVD documentary reveals the Tube is packed with paranormal activity!